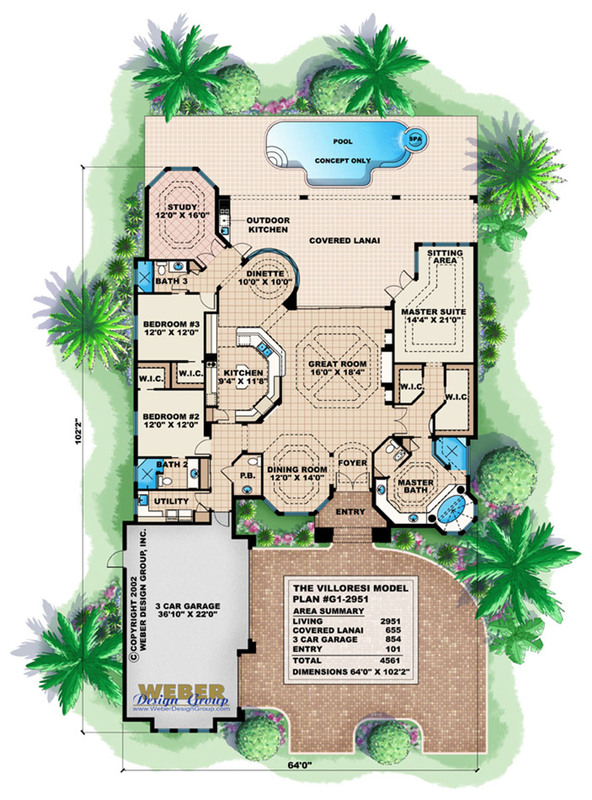 The welcoming entry of the Villoresi Mediterranean house plan invites your family and friends with a double-entry arch top door and the sound of running water from a wall fountain. As you enter, the formal dining room is to the left and then your eye draws directly to the spacious great room and the wall of pocketing glass that creates a seamless indoor-outdoor transition to the covered lanai with an outdoor kitchen that lies just beyond. The adjacent island kitchen and dinette extend this casual gathering space for hosting family and friends. The master bathroom has a large walk-in shower, with a garden tub perfect for long soaks. Each of the guest rooms has a large walk-in closet and a private bathroom. There is also a powder room, utility room and a three-car garage making this home plan very well-appointed for just under 3,000 square feet!